Artist rendering; subject to change. Phoebe Ministries is a multi-facility organization specializing in healthcare, housing, and support services for older adults. Located in seven Pennsylvania counties, it serves approximately 15,000 seniors annually. Jim Bodine, representing HJ Sims and prior investment banks, has worked with Phoebe Ministries for more than 25 years on a variety of engagements. Phoebe engaged Sims in May 2018 to assist with evaluation of financing options related to its new campus development (Phoebe at Rodale), and additional capital needs at its Phoebe Berks community. Phoebe’s new campus project, Phoebe at Rodale, is located on a 38-acre site near the historic downtown of Emmaus, PA, and former home to the headquarters of the publishing company, Rodale, Inc.
Financing needs totaled $18 million: 1) $12 million for land acquisition; 2) $4.5 million for capital improvements at Phoebe Berks campus; and 3) $1.5 million for funded interest and financing costs. The debt was structured as interim financing, to be repaid with permanent financing, anticipated in the next 12-24 months. Additional structuring considerations included: 1) the use of either tax-exempt or taxable interest rates; 2) the preferred obligor for the financing as either a stand-alone borrowing or as part of the Phoebe Ministries Obligated Group; and 3) the timing necessary to close on the land acquisition along with anticipated funding needs for the Phoebe Berks project. Sims assisted Phoebe with a highly targeted commercial bank financing solicitation, with Phoebe ultimately selecting Citizens Bank. Sims and Phoebe analyzed both the tax-exempt and taxable structures proposed by Citizens Bank, and ultimately decided on a taxable structure, minimizing the anticipated all-in cost of financing and enabling expedited closing of the financing. Phoebe closed the taxable $18,000,000 interim financing with Citizens Bank in early November 2018. It achieved its financing objectives including: 1) securing cost effective and flexible interim funding for the combined capital expenses; 2) draw-down flexibility to borrow as costs are incurred; and 3) flexible repayment provisions to occur as part of subsequent permanent financing. Financing will allow Phoebe to advance the Rodale project planning and development process on a timely basis with the goal of implementing permanent financing and commencing construction in the next 12-18 months. Phoebe Ministries (“Phoebe”) is a not-for-profit, multi-facility organization specializing in healthcare, housing, and support services for older adults. Founded in 1903 and affiliated with the United Church of Christ, Phoebe offers a full continuum of care to suit the diverse needs of older adults. Located in seven Pennsylvania counties and serving approximately 15,000 seniors annually, Phoebe features four continuing care retirement communities, eight affordable housing facilities, home and community-based services, and three pharmacies. Collectively, Phoebe provides a variety of residential living options (independent and assisted), and services including long-term care, short-term rehabilitation, geriatric care management, specialized programs for persons with cognitive diseases such as Alzheimer’s and respite care. Further, through its Phoebe Services affiliate, it provides pharmacy services to related and unrelated organizations. The Phoebe’s Ministries Obligated Group is comprised of: i) Phoebe-Devitt Homes (the “Parent”), ii) three of four CCRCs (Phoebe Allentown, Phoebe Berks & Phoebe Richland), iii) and Phoebe Services. Jim Bodine, representing HJ Sims and prior investment banks, has worked with Phoebe Ministries for more than 25 years. This includes work on financing for the start-up of the Phoebe Berks campus, financing of capital investment needs at multiple affiliates on multiple transactions as well as refinancing with both bond and bank financing. Understanding Phoebe’s desire to explore additional growth, this has also included consideration and introduction of opportunities for new campus development and affiliations of potential interest to Phoebe. As Phoebe refined plans for development of a new campus, it engaged Sims in May 2018 to assist with evaluation of financing options for initial project costs, particularly land acquisition, as well as capital needs at its Phoebe Berks campus. Phoebe’s new campus project, Phoebe at Rodale, is located on a 38-acre site near the historic downtown of Emmaus, PA. The property was the former home to the headquarters of the publishing company, Rodale, Inc. The project will include the adaptive reuse of one building and teardown and new construction of another. 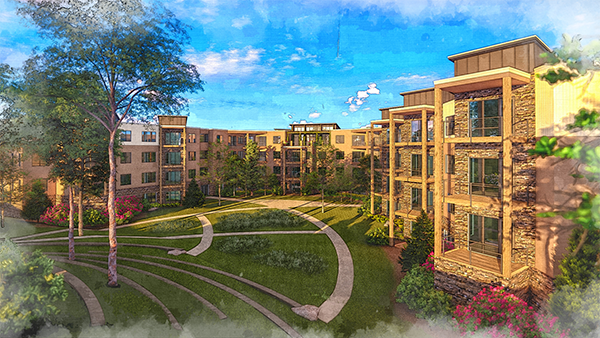 Management of Phoebe has conceptualized an upscale senior housing offering that will emphasize health, well-being, and interaction with the local community in Lehigh County, PA, and in proximity to two of its existing campuses, Phoebe Allentown and Phoebe Richland. The new community will be distinctly independent living focused and will not offer healthcare related services on-site. With this as background, Phoebe sought financing for initial expenditures for the Phoebe at Rodale project along with additional capital needs. Specifically, this consisted of $18 million of total financing with 1) $12 million for the purchase of land related to the Phoebe at Rodale Project; 2) $4.5 million for the refurbishment of dining and commons areas at the Phoebe Berks campus in Wernersville, PA (“Phoebe Berks”); and 3) $1.5 million for funded interest and financing costs. Phoebe’s financing objectives included: 1) securing cost effective and flexible interim funding for the combined capital expenses; 2) draw-down flexibility, particularly for the Phoebe Berks Project costs, to be incurred over 12-18 months’ time; and 3) flexible repayment provisions to occur as part of subsequent permanent financing. In addition, key structuring considerations included: 1) the use of either tax-exempt or taxable interest rates, balancing the lower interest cost of tax-exempt financing with the lower financing costs and shorter time frame for implementation for taxable financing; 2) the preferred obligor for the financing as either a stand-alone borrowing by an existing or new Phoebe affiliate or as part of the Phoebe Ministries Obligated Group under its existing Master Trust Indenture and Bank Financing Agreements; and 3) timing necessary to close on the land acquisition along with anticipated funding needs for the Phoebe Berks project. With the interim nature of the Phoebe at Rodale project financing, particularly, and the compressed time frame to access financing for the land acquisition, Sims assisted Phoebe with a highly targeted commercial bank financing solicitation. This included Phoebe’s existing commercial banking partner, Citizens Bank, and two additional banks with which it had existing institutional or individual banker relationships. Similarly, the financing request focused on interim financing, with either tax-exempt and/or taxable interest rates, secured on a parity basis with the Phoebe Ministries Obligated Group’s outstanding debt. Phoebe received proposals from all three banks. Sims assisted Phoebe with the review of the proposals and negotiations with the banks. Upon completion, Phoebe selected Citizens Bank to provide the financing. With the source of financing selected, Sims and Phoebe analyzed both the tax-exempt and taxable structures proposed by Citizens Bank, and ultimately decided on a taxable structure. By issuing taxable debt, Phoebe minimized its anticipated all-in cost of financing – interest rate and up-front financing costs, and was positioned to complete the financing more quickly. On November 2, 2018, Phoebe closed the taxable $18,000,000 interim financing with Citizens Bank. The financing allows Phoebe to proceed with the Phoebe at Rodale Project, notably land acquisition, while also accessing funds for the Phoebe Berks projects, as cost are incurred. At closing, Phoebe drew $12 million for settlement of the land acquisition and plans to draw loan proceeds over the next 12-18 months for additional capital expenditures at Phoebe Berks and funded interest. As desired, the financing will allow Phoebe to advance the Rodale project planning and development process and be in a position to repay the financing, along with funding project construction and related costs, via a permanent financing in the next 12-18 months. For more information on how Phoebe Ministries was Financed Right® by HJ Sims, please contact Jim Bodine at jbodine@nullhjsims.com or (215) 854-6428 or Patrick Mallen at (203) 418-9009 or pmallen@nullhjsims.com.